The San Francisco Controller's Office conducted an undercover investigation of cable car operators and on Monday released its finings to Muni’s Board of Directors and the general public. Ding, ding, ding  it's bad. The San Francisco Chronicle reports that during the 17 days of the December 2016 investigation, undercover auditors dressed in fake mustaches plain clothes boarded 30 cable cars on the down low. They reported that 37% of the time, cable car operators didn't bother to collect the $7 cash fare from riders. According to the report, most of the free rides "occurred either when the rides began mid-route (not from a terminal), during commute hours, and/or when cars were relatively empty. Fares were not collected from CSA auditors most often on the Powell/Mason and Powell/Hyde lines." Auditors also discovered that operators didn't ask for proof of payment 70 percent of the time, meaning that and estimated 178 people rode a cable car without paying  to the tune of $1,246. This is the same investigation, you might recall, that discovered two separate and independent cable car operators were pocketing cash fares and laundering the money. "Over the years, we've used audits like these to pinpoint ways we can improve our cash collection procedures while maintaining flexibility for customers to pay for their ride. We are making changes to promote cashless ways to pay for Cable Car service, including the use of MuniMobile and a pilot program for pre-paying fares at Cable Car turnarounds," said Paul Rose, a spokesman for Muni. The Examiner reports, however, that according to the SF controller's office, "It is unlikely, however, given the ridership demographics, including tourists, that a full cashless system will be possible." The report recommended exploring other option for collecting fares as opposed to trusting humans. 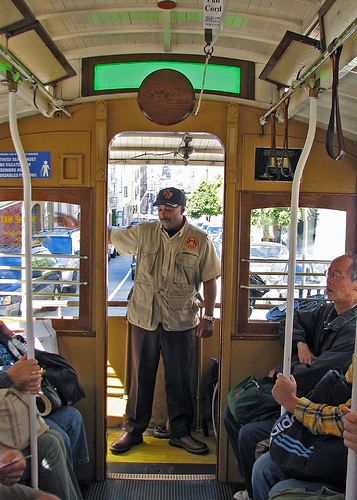 Ideas on the table include fare boxes on board cable cars, a prospect Muni isn't wild about. The report only covered 30 rides over 17 days, a data collection that the controller's office concedes is not really enough to make a full assessment of the whole cable car cash situation. "We want to do more cash audits and see what our data tells us from that point. We want to be careful, and we want to be fair," said Tonia Lediju, the chief audit executive at the controller's office.